To commence reward based training with Mojo I have first to classically condition the bridge signal. A bridge signal is to tell the horse he has done the correct behaviour, it is applied as soon as the behaviour we want occurs – the reward can then be given once the horse is calm and relaxed e.g not mugging or looking for the reward. 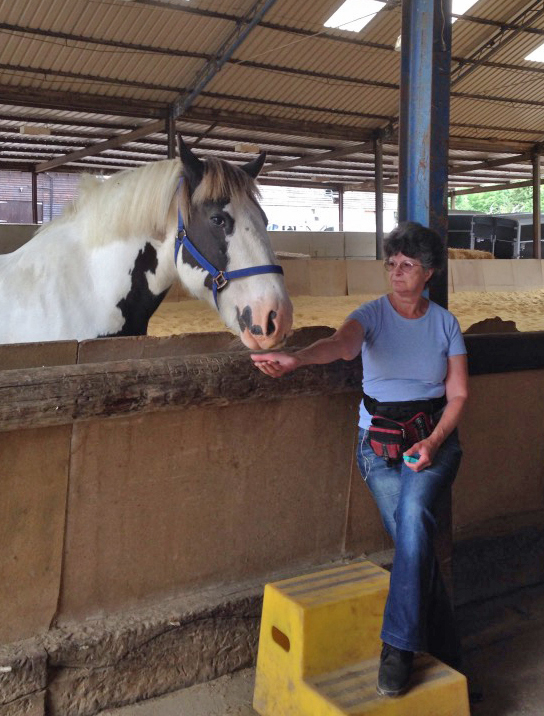 To condition the signal we start with the unconditioned stimulus(UCS) (food or scratches etc) and get an unconditioned response (UCR) – the horse accepting the reward. We then pair the UCS with a neutral stimulus (NS) (the bridge signal) – this can be a verbal noise or a clicker. The NS then becomes a conditioned stimulus and the UCR becomes a conditioned response as it becomes associated with the reward. So the bridge signal says “yes that is what I want”. I decided to use a clicker to mark as a bridge signal. My first clicker session with Mojo didn’t go too well. My aim was to classically condition him to the clicker – so pairing the sound with the reward. However poor Mojo jumped and ran off when I clicked, it was a rather loud clicker – so now I have a softer sounding one to use to desensitise him to the sound before going any further. I have just been down to see him and his owner was there so we took him to the indoor school and I tried with the quieter clicker and he was fine. A few times with that and I tried the louder one and again no reaction apart from looking for a treat. I got him to stand nice and calm with his head straight. So I now feel happier about it all. For more information about the terms used here Karen Pryor as a list which I found useful. Jo Hughes is in the process of making a video to show how to get the head straight and to help with impulse control – so I will watch that before doing any more with Mojo. I am away for a week so will recommence once I come back. Mojo is out in the field all day and night, so is enjoying just being a horse with his friends. I will of course go and see him in the field before I go. 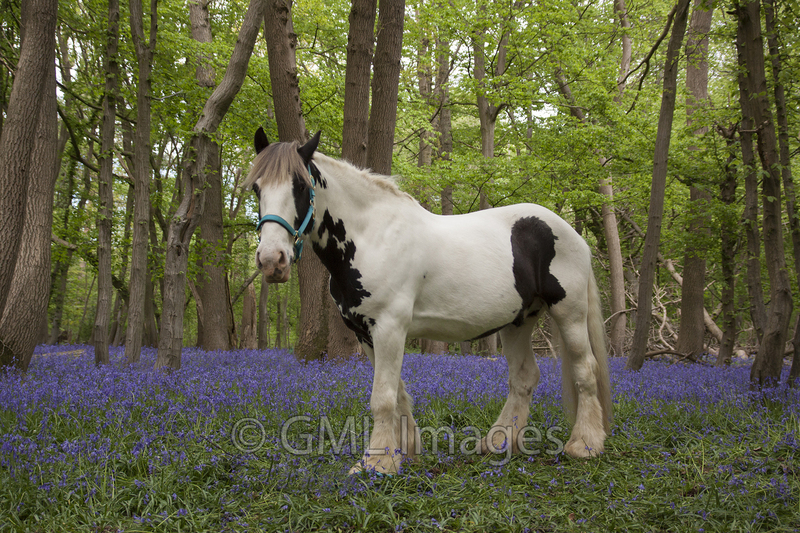 I have a new loan horse, Mojo, he is a 9 year old Irish cob abut 15.1 and piebald. He belongs the the lady whose horse I was having lessons on and he was her daughters horse. Mojo is however a little on the sensitive side with regards to being touched. So I will spend time assessing this and doing systematic desensitisation and counter conditioning. Mojo was the field companion of Benny so I do know him quite well. Is the avoidance of an aversive a reward? Is release of pressure a reward? Following on from the previous post I have been researching the role of dopamine in emotional reactions. A very limited literature search – the subject is vast and I am not an expert. There are of course other hormones and neurotransmitters involved in all processes. In horse training, when using the addition of an aversive stimulus to initiate a behaviour, e.g traditional and natural horsemanship, it is the removal of the aversive stimulus that is reinforcing. This is negative reinforcement as described in learning theory. So if this is correct then it may be a reward, but horses don’t seem to actively seek the application of an aversive event to gain that “reward”. They actively learn to avoid the aversive stimulus, by complying at the first indication (a cue) that an aversive stimulus might follow if they don’t comply. It is clear from the above that if we use aversive stimuli we must put a cue in place to predict the aversive – so the horse can avoid the application of the aversive. When we use appetitive stimuli to reinforce a behaviour it is the anticipation of the appetitive that initiates the release of dopamine. (1) So horses actively seek the reward and can get quite animated in doing this and may offer more than we expect. So in training should we limit the use of aversive stimuli and increase the use of appetitive stimuli? Horses may feel good if they avoid an aversive stimulus but how do they feel during the conditioning (training) process. All these are fascinating questions and I do not know the answers – but it does make me more aware of how and why horses learn and how they may feel about the process.